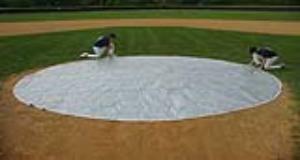 Economical 18' Base Cover or Little League Home Plate Cover constructed of 6 oz. Silver/White lightweight Poly Fabric. Offers a 2 year prorated warranty. Reinforced perimeters with brass grommets. Ground Stakes Included (6 each) .